Audiophiles in the know will no doubt be aware of dCS. 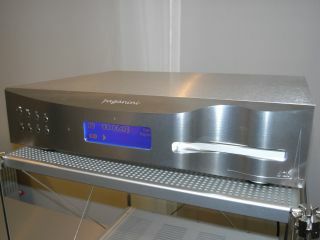 The legendary digital audio expert is renowned in the hi-fi world for its first-class, yet expensive CD replay systems. But now to compliment its Scarlatti CD/SACD replay system (a cool £33,000), the Saffron Walden-based company has introduced the Paganini. Like the Scarlatti, it's a three-box system comprising transport (£799), a digital to analogue convertor (DAC) at £8,999 and a Master Clock (£3,999). The new 'budget' components are based on the reference Scarlatti, but come in at a sizeable £12,000 less. But, of course, this is no ordinary CD player. The transport has a dual laser, two-channel CD/SACD mechanism with a wide range of digital audio outputs. These connect the transport to the custom-made D/A convertor, which uses a Ring DAC (dCS's proprietary D/A conversion architecture). To keep things ticking over correctly, both devices benefit from having their data reclocked via the Paganini Master Clock. Hi-Fi Choice's special high-end issue, The Collection, on sale now.